This book reports on the development and control of the bipedal walking robot Lucy. The main purpose of the biped is to evaluate the implementation of compliant actuators and to develop control strategies for bipedal locomotion. Compliant actuators are currently studied and applied in walking systems for research in the field of low-energy consumption walking. Often the approach is to start from passive walkers while adding control to be able to walk on level ground, to be more robust against disturbances and so on. Disadvantage of this group is that the number of walking motions is limited. 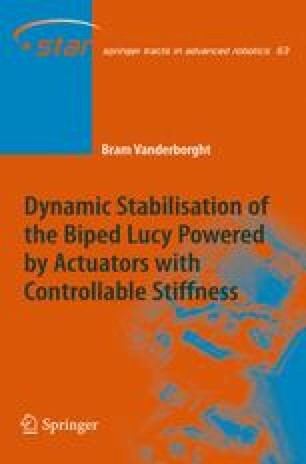 The approach intended for Lucy is to start from dynamic stable trajectories which are tracked by a tracking controller.Afterwards a compliance controller should select an appropriate stiffness so the motion of the natural dynamics correspond as much as possible to the reference trajectories. Advantage is that the robot will be capable of starting, stopping and walking at different walking speeds and step lengths.